Chetham’s Community Music Programme is designed to take live music to people who might otherwise have little access to it. On Friday 17 November, seven Year 10s took part in project at Lancasterian School in Didsbury, a specialist school for children 3-16 who have physical, complex medical and / or complex communication difficulties. 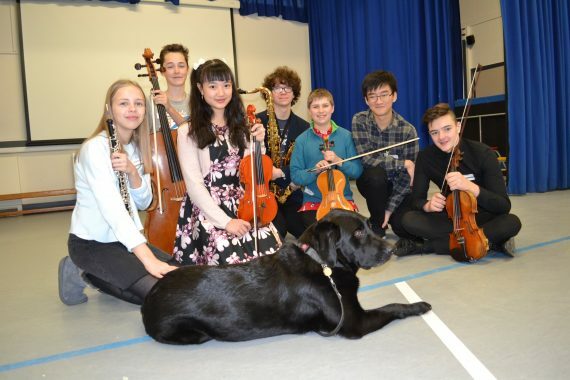 The students worked with a class called Hawkings, who, every Friday, have a sensory story centred around their school dog, a black Labrador called Albert, who joins them in the classroom. Chetham’s musicians created a soundtrack to enhance the story, with an Albert theme and a range of sounds to reflect actions in the story. This culminated in an assembly, in which Chetham’s students introduced their instruments by playing familiar tunes (both Mario and Pepper Pig received a hugely enthusiastic response!) and helped Hawkings present their Albert story for the whole school to enjoy. We’ve since had some wonderful feedback from Lancasterian. These included highlighting a boy, who only uses limited vocals, singing Albert’s name, and a girl who loved having the saxophone played to her in her wheelchair, as she took Albert along the corridor back to the office. If you would like to know more about our Community Music Programme, please feel free to contact us.